For visitors to the north Kent coast, Reculver Towers on the sandy cliffs of Herne Bay would be a perfect spot to stop for a picnic and a spectacular view of the surrounding landscape. These twin towers date back to the twelfth century and are what remains of a Saxon church, once known as St. Mary’s that was mostly demolished in 1809. 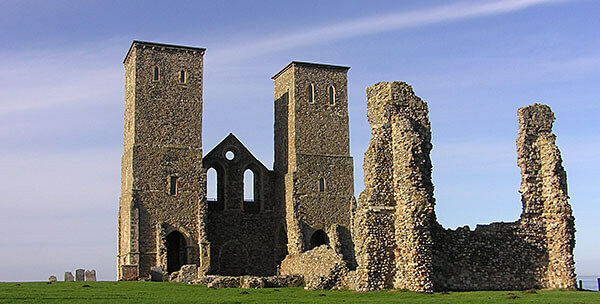 Reculver was a strategic location in ancient times where the Romans first built a fort as far back as 43 AD. Afterwards, it is believed the site contained an Anglo-Saxon palace and monastery. During the Middle Ages, the two stone spires were known as the Twin Sisters by mariners who used them as a marker. The towers, which can only be viewed from the exterior, have become one of the area’s important attractions. The public is invited to visit them during all reasonable daylight hours. They are located in the Reculver Country Park, which is an important Special Protection Area that is a resting place for thousands of migratory birds. Entry is free, as is the parking that is available, along with picnic sites. The visitors’ center in the park offers information about the area’s history and the wildlife along the coastline. The site is open during reasonable daylight hours. Viewing is from the outside only. Last updated by Ginny on 20 January, 2013 in Destinations. Nice post! Reculver is amazing and you can walk from there all along the coastal path to the gorgeous sandy Minnis Bay beach, where there's also the very well regarded Minnis Bar and Restaurant, close to the pretty village of Birchington.